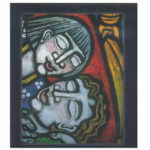 Books, DVDs, Glass Eye drawing software, stained glass painting information – PELI Glass Products B.V.
Books and videos on stained glass painting and glass art techniques to inspire and instruct you! 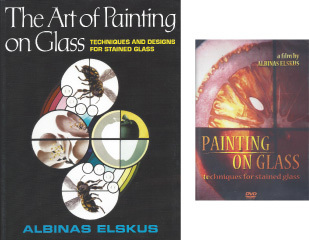 We have the Albinas Elskus glass painting book and companion video, “The Art of Painting on Glass” – classic references for glass painters. We have other books / videos / drawing software for you as well! C. Thompson – Dreaming of spirit Animals (Video DVD, EN), the creation of the largest hand-painted stained glass window in the US: 27 x 10 meters. 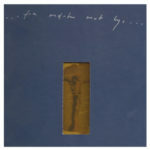 K. Nupen – “… fra mørke mot lys…” (NO,EN), work in glass for Søm Church, Kristiansand, Norway. Includes video DVD. Glass Eye software, draw a design, fill in the glass colors and textures… this makes it easy to discuss with the client! Free Information Sheets – Also check out the gratis information sheets below on glass painting techniques and lusters! Would you like to have a non-binding offer for any items? Let us know today! Send us an email at mail@peliglass.eu or call us at +31(0)628 755 901.